BofI Holding, Inc. has faced some nasty accusations recently, but has answered most of the allegations. 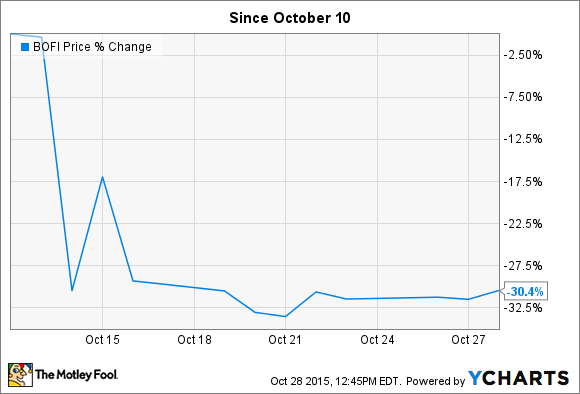 Here's what to look for when the bank reports earnings. Unless you've been living in a cave -- a cave without Internet or cable, that is -- for the past few months, you're surely aware of the charges levied against BofI Holding (NYSE:AX) in a lawsuit by a former employee. The company has been accused of a number of illegal activities, including knowingly banking with criminals, falsifying financial reports, and even accusations of money laundering by the CEO. The result? Management held a conference call to address the allegations, and despite a jump following the call -- you can see it in the chart above -- shares have remained sharply lower as the market tries to digest it all. BofI Holding reports first-quarter financial results on October 29, and if history is any guide, is likely to report strong growth and profits. Let's take a closer look at what you should be watching for. BofI Holding, like any commercial bank, makes most of its income on loans. And to grow its loan portfolio, it needs capital to lend. There are two primary sources of capital that the bank has used during the past few years to drive growth: deposit growth, and stock offerings. Here's the thing... stock offerings can be useful, but they also dilute your shareholder base, and negatively impact per-share earnings. As a result, they can be harmful ways to pay for growth, while deposit growth is much more healthy and sustainable. The downside of adding deposits, of course, is that the bank must pay interest to those depositors, making money on the spread between what it pays out in interest, and what it can charge on loans. But the value of adding deposits is deeper than just avoiding shareholder dilution: You're adding more customers. Building relationships with more customers, both consumer and business, is critical to the bank's long-term growth strategy and success. So pay attention to growth in deposit assets. When BofI last reported in July, deposit assets had increased 46%, and loan assets were up 40%. Those are incredible growth rates, but here's some context. Banking giant Wells Fargo & Co. (NYSE:WFC) recently reported quarterly financial results, and announced that its loan portfolio was up 8% at the end of the quarter, and that deposits were up 6%. Here's the kicker: Average loans at Wells Fargo in the quarter were $985 billion, and average deposits were $1.2 trillion. BofI Holding finished its last quarter with $5 billion in loans, and $4.4 billion in deposits. To put it another way, BofI is about a half-percent the size of Wells, based on loan and deposit assets. So there's room for growth. Per-share growth is the key for measuring BofI's ability to reward investors, and probably the best metric to use to track this is tangible book value per share. This metric is a good way to track the bank's growth in assets, and determine how much of it is reaching shareholders. Since BofI is likely to keep using share offerings -- at least as part of its funding strategy -- the per-share measure is what matters to investors. 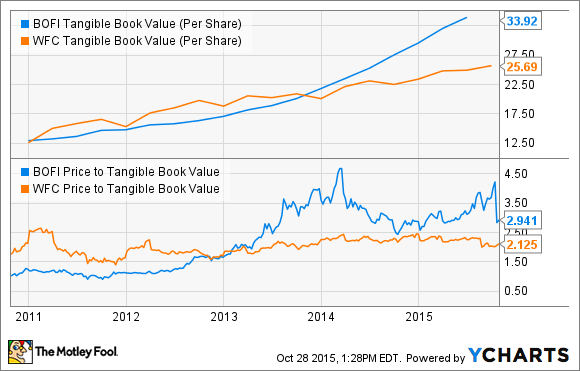 BOFI Tangible Book Value (Per Share) data by YCharts. I've included the price-to-book value multiple above, as well. This metric, similar to the price-to-earnings ratio, normalizes the stock price so that you can compare BofI's stock to that of its peers like Wells Fargo. As you can see, even after the recent collapse, BofI's stock still trades at a hefty premium. But that makes sense when you consider the bank's fantastic growth rate, and low-cost web-based business model. BofI is likely to be dogged by the allegations in the former employee's lawsuit for some time -- at least until the case is resolved. But it largely comes down to trust: Doesn't it always, to some degree or another? Here's the key as I see things. BofI Holding spent much of the last year undergoing some pretty stringent audits as part of its acquisition of H&R Block's deposit accounts. I find it hard to trust a former employee -- yes, an auditor -- who is filing a civil lawsuit after the regulatory authorities have reviewed the bank closely, and basically said that there's nothing wrong. As fellow Fool Brian Stoffel recently pointed out, there are definitely questions management should give better answers to; but the allegations have already undergone a lot of regulatory scrutiny with no repercussions. Here's the bottom line: We each must decide if the potential risk -- whether real or perceived -- is worth taking on based on the potential returns. If your perception is that there has to be fire with so much smoke, then stay away. BofI has consistently grown loans and deposits at an incredible rate during the past several years, and that rate has actually accelerated. While the upcoming earnings announcement will cover the period before the recent allegations, it's a good idea, looking forward, to keep an eye on the potential fallout of damage to the bank's reputation. To put it another way, perception is reality -- at least for banks. If consumer confidence in BofI is affected, that could lead to slowing deposit and loan growth, or even a worst-case scenario of the loss of a few major large depositors leading to a small "run" on the bank. This is unlikely, but it's a risk that can't be ignored out of hand. At the end of the day, keep an eye on the fundamentals discussed above. If the bank gets past these accusations unscathed, the long-term looks pretty great.